Clapham Common is partly in Lambeth, partly in Wandsworth and was formerly two commons belonging to the neighbouring parishes. Its importance for recreation was early acknowledged and it was subject to landscape improvement from 1722 onwards. In 1836 a management committee secured a lease from the two lords of the manor. Following the Metropolitan Commons Act of 1866 the MBW assumed responsibility for a number of commons including Clapham, which it purchased in 1877, and introduced a programme of improvements and facilities. 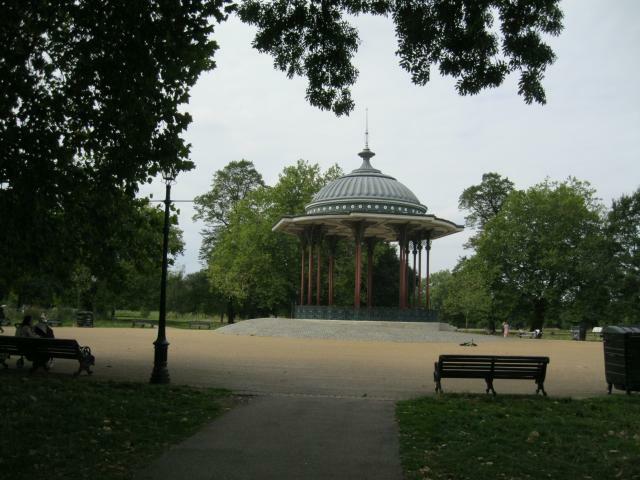 In 1890 a reproduction of the bandstand in the Royal Horticultural Society's gardens at Kensington was erected here. From the early C18th Clapham Common was subject to landscape improvements, with ornamental planting funded by subscriptions from local residents from 1722 onwards. In 1836 a management committee secured a lease until 1871 from the two lords of the manor. Its use for recreation increased particularly after the conversion of Kennington Common into Kennington Park (q.v.) in 1852. However, there were problems of crime and assault and only one keeper was employed to look after the whole common. After the passing of the Metropolitan Commons Act of 1866, the Metropolitan Board of Works assumed responsibility for a number of commons including that at Clapham, which it purchased in 1877 under the Metropolitan Commons Supplemental Act 1877. Under the Act the MBW had powers to improve the landscape and its importance for recreational use was early acknowledged. The MBW introduced a programme of improvements to the public amenities including draining, levelling and planting. Committee Minutes in December 1877 refer to resolutions to provide various other facilities including a portion for horse riding to be defined 'by trees and short lengths of fencing' with ditches filled in and other works at an estimated cost of £400; and a stand for animals to be formed near the Rookery. Bathing in the ponds between 8pm and 7am was prohibited at that time except in Mount Pond; and permission was given for the erection of tents 'for the purposes of shelter or refreshment' by those playing using the common for 'lawful games' such as cricket, football, and golf. Formal paths were laid out and the ponds were allocated to different uses, and some of them have subsequently been filled in. In 1890 a reproduction of the bandstand in the Royal Horticultural Society's gardens at Kensington was erected on the common. This had been designed by Francis Fowke for the RHS in 186l, and the two original Fowke bandstands from the RHS Gardens were erected in Southwark Park (q.v.) and Peckham Rye Common (q.v.). Responsibility for Clapham Common passed to the LCC, then the GLC and later to LB Lambeth. Since 1948 play areas have been introduced as well as new facilities such as the One O'Clock Club and the pavilion by the Long Pond. The Common has become a venue for a number of major events each year, with an enclosure north-east of the bandstand erected for the purpose. Today it is a mainly flat landscape with grass, trees and ponds; the bandstand and its setting have been restored with an HLF grant. Other designed elements include Mount Pond which survives from the C18th, a riding avenue of 1877, various ponds originally derived from former gravel pits and later used as cattle and cart ponds.